With a new academic year underway, many students will be thinking about their upcoming ‘A’ level exams and the possibility of going on to higher education. Some may have already decided what course they’d like to take and what universities they’ll apply to. Others may be poring over the prospectuses or perusing the relevant websites before making up their minds. All I imagine, if only for curiosity’s sake, will be interested in looking up the 2017 Academic Ranking of World Universities that’s recently been published. According to Wikipedia, the ranking is considered one of the three most influential university measures, together with QS World University Rankings and Times Higher Education World University Rankings. In this year’s edition, as in previous ones, United States universities dominate, with 48 in the top 100. Harvard places first for the 15th year with Stanford second. The University of Cambridge has overtaken two other American universities, Massachusetts Institute of Technology and the University of California, Berkeley, to make third place overall. Traditional rivals Oxford come in at number seven. There are nine British universities in the top 100 including Cardiff University, which breaks into this élite group for the first time at number 99. My alma mater, Bristol University, is 61st. For context, only eight of the 28 European Union member states have universities that feature among the world’s 100 best. Germany and Netherlands have four each, France and Sweden three. Spain has none in the top 200. I don’t know about you, but the much-vaunted e-government that was supposed to make our lives so much easier didn’t work for me. I hadn’t resorted to using it before, but when I received a letter from the Driver and Vehicle Licensing Department informing me that my car was due for its first roadworthiness test I decided I’d give it a try. Rather than go to the counter at the Test Centre in Devil’s Tower Road, I thought, I’ll arrange an appointment online. After all, the Number Six press release three years ago announcing that e-government had arrived claimed: “No-one will ever need to…queue to book a Driving Test at the MOT Centre”. Maybe not a driving test, but I’m afraid I did end up having to go there in person to book the roadworthiness test. Admittedly the problems started after an initial mistake on my part. When I went to the egov.gi website I booked the first available slot and paid the £31 fee, not remembering I would be away from Gibraltar on that day. Still, this must also have happened to other people I guessed. I’ll just telephone the office and ask to change the date. Wishful thinking. You have to cancel and rebook online yourself; the staff can’t do it for you. And, by the way, you have to pay the fee a second time before your first payment is refunded. This wouldn’t have unduly bothered me if things had gone smoothly from then on. But they didn’t. The computer asked me for a booking number that I hadn’t been given. When I requested it, it said it couldn’t find my appointment with the information provided. When I called the department a second time the sympathetic lady at the end of the line sounded like she’d heard it all before. Oh dear, you haven’t been sent your booking details. Ah yes, you want to change the appointment but can’t cancel online. Tell you what, why don’t you bring us your logbook and we’ll sort it out. Which I did the next day. But it kind of defeats the purpose of e-government, doesn’t it? An elephant statuette is drinking milk, they told me, get down there and investigate. Sure, I thought. And if I look out the window I might just see pigs flying. I had finished work for the day and was relaxing at home when the call came from the GBC newsroom. A “miracle” that had occurred in India that day, and spread to various countries, was also taking place in Gibraltar. 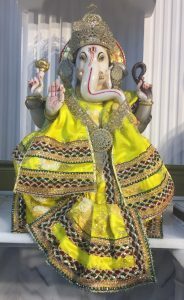 It was September 21st 1995 and worshippers at a New Delhi temple were astounded when a statue of the Hindu elephant-god Ganesh seemed to accept an offering of milk, “drinking” it through its trunk. Within a few hours there were many similar reports across the country and in Hindu communities further afield including in the USA, Canada and the UK. I recalled this event after reading reports that a Russian MP claimed a statue of the last emperor, Nicholas the Second, began to cry on the 100th anniversary of the revolution that deposed him. Natalya Poklonskaya, a member of Vladimir Putin’s ruling United Russian party, said it was a miracle no one could explain. As those who know me know, I’m rather sceptical about the supernatural. My expectations of a “good story” were therefore pretty low when we set off for the flat in Parliament Lane where the phenomenon was said to be happening. Places of worship are often solemnly lit, and so it was here. The apartment was illuminated only by candlelight and full of people. I knew many of them and my presence was not seen as an intrusion. On the contrary, they obligingly made space for my cameraman and I to reach the right room. There, inside a metal bowl placed on a table, stood a figure of Ganesh one of the best known and most worshipped Hindu gods. The statue, they said, had been drinking milk for several hours. Would I like to offer it some? Yes, I said. But privately I was a little unsure. What if it didn’t happen, how awkward would that be? With everyone looking on and the camera rolling, I placed a tablespoon of milk below the effigy’s trunk and watched incredulously as the level of the liquid dropped until there was none left. I repeated the action several times with the same result. The milk unfailingly drained from the spoon. I even examined the statue to satisfy myself there was no trickery involved and found no evidence of anything suspicious. There was no mechanism or opening in the trunk through which the milk might have entered. Scientists would later try to rationalise the event, suggesting the milk was drawn up by capillary action. Maybe so, but that doesn’t explain why all attempts to “feed” Ganesh after midnight met with failure. And while there have been reports of similar incidents since, none has had the same worldwide impact. All I can say is that that assignment remains one of the most memorable and intriguing of my career. Author gibstevePosted on 25th September 2017 Leave a comment on Was it a Miracle? As Gibraltar continues to grapple with traffic congestion could there be an unexpected solution around the corner? The 2017 edition of an annual study called Beyond The Car indicates that while car ownership remains strong for the moment, attitudes may be shifting. In 2016, 29% of respondents saw ride sharing and the ability to book a cab through their smartphone as an alternative to owning a car. This year that had gone up to 34% – over a third. 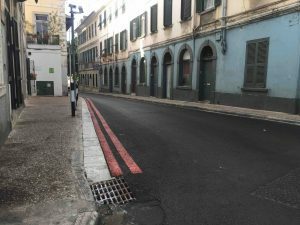 Of course Gibraltar doesn’t have a tap-and-ride service like Uber yet. But it surely can’t be long before we catch up with the major cities of the world in this aspect of modern life. We already have one significant advantage over most other places, a free public bus service. That, coupled with on-demand transportation, might eventually persuade some of us to use our car less, if not actually deter us from buying one in the first place. Which would be just as well because, as the long-suffering motorist knows, parking too remains a major problem. 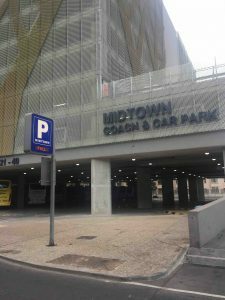 Numerous car parks have been built in recent years, both under the present and previous administrations, but to little avail it seems. Why is this? Nature abhors a vacuum, the saying goes. Maybe the same is true of a parking lot: build it and they – cars – will come. It’s certainly true of the car park above Catalan Bay, ‘my’ beach for nearly forty years. I was there by ten o’clock on some mornings this summer when very few people were around, yet already parking spaces were scarce. Apart from those occupied by derelict vehicles, most were taken by Spanish-registered cars. Some, no doubt, belong to employees of establishments in and around Catalan Bay village. But the sheer number suggests others must be using it too and not for the purpose of going to the beach. I’ve noticed a similar trend at Landport Ditch at weekends, when parking is free. And why must so many spaces in multi-storey car parks be made available for purchase or rental? It’s good for the government’s coffers no doubt, but doesn’t it defeat the purpose if you build a super-duper car park but over time the number of spaces available for the public steadily decreases as the better off buy or rent there? I’ve seen the ‘full’ sign lit up at the entrance to the Mid Town car park rather more often than you’d expect for a facility of that size. Fingers crossed that the projected new car park at Grand Parade doesn’t go the same way. 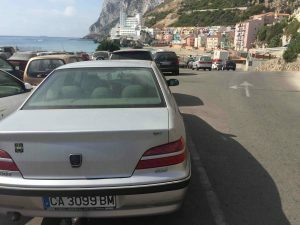 The fact that this policy frees up roadside parking spaces is of little consolation to locals because many of them, as at Catalan Bay and Landport, are taken up by non-residents. Another factor that contributes to the parking problem is the removal of spaces on the public highway for reasons such as the widening or construction of pavements. 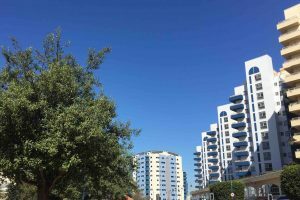 While this is welcome from the pedestrian’s perspective it inevitably results in the sudden loss of parking availability, sometimes in areas where residents have for years been used to leaving their cars unhindered. There’s no easy solution, and governments inevitably shy away from taking drastic steps that would be unpopular with voters. But unless something happens to reduce car ownership demand, the bullet’s going to have to be bitten. Well, summer’s nearly over and I can report that I’ve turned a deeper shade of brown over the last couple of months. What’s tickled me pink between sunbathing sessions though is the language used by estate agents to try and persuade you to buy one of their properties. One of my wife’s hobbies is what I call ‘pretend house hunting’. We lived in our first home for 14 years and have moved three times since. We’ve been at our present address for nearly two decades and I tell her she has absolutely no prospect of getting me to up sticks again despite her view that we should downsize, now that our children are grown up and have flown the roost. Does that deter her from perusing every property advertisement that comes her way? Not one jot. Which means I end up reading them as well. In the forlorn hope of curbing her zeal, I’ve taken to translating estate agent-speak for her. For instance: how likely is it, as claimed, that a one-bedroom flat with a combined kitchen and dining room (described as ‘open plan’ to make it sound nicer) and a bathroom with no bath, but a ‘walk in’ (not ‘drive in?’) shower is truly ‘amazing’ and ‘wonderfully appointed’? What does wonderfully appointed even mean? Or take an apartment that ‘benefits from’ (why not simply ‘has’?) a ‘small room, which is currently used as a store room’. That’s because, try as you might, you just can’t fit a bed in it. Otherwise it would be touted as having one more bedroom. And for the prospective purchaser’s sake, let’s hope the fact that the flat has an ‘airy feel throughout’ isn’t code for ‘it’s draughty’! Consider also the fantastic, ground floor, corner studio apartment that ‘offers full open plan living’. Enticed? Me neither. Especially when the balcony offers “views over the rooftops” (seriously, that’s what it says) and ‘partial views of the sea’. Our second home was sold to us on the basis of it having partial sea views. The reality was that it was a Rock-facing flat from where you could just about glimpse a sliver of blue below the horizon if you stood sideways at one end of the balcony and craned your neck 45 degrees anti-clockwise. Not worth the effort believe me. Be wary, too, of adverts that highlight nearby amenities rather than the property itself. One I saw mentioned practically every kind of establishment in the neighbourhood, from a hairdresser to a showroom, but didn’t point out that the flat is in a location that’s inaccessible by road and parking in the area is a nightmare. This particular property has a ‘fantastic walk in shower’ (another one) and ‘a small but perfectly formed area for storage’. I’m still trying to work that one out. Another recognised estate agent tactic is to use pleasant-sounding words and expressions to disguise the truth. A ‘galley kitchen’ may conjure up thoughts of enjoying a romantic dinner at sea. If the kitchen’s in a flat instead of a boat though, the reality is more prosaic: there’s no room for a table and chairs and probably not enough space for more than one person to be in it at any one time. Flats are sometimes described as one or two ‘bedroomed’. Be suspicious. This could signify they’re poky, little box-rooms and the suffix is intended to make them sound grander. And why do so many advertisements end with the exhortation that viewing is ‘a must’ or ‘highly recommended’? Surely no one in their right mind is going to buy a property without seeing it first, are they? P.S: Estate agents please disregard everything I’ve said and be as florid and imaginative as possible with your descriptions of our home, should we end up putting it on the market after all! Another music great left us this week. 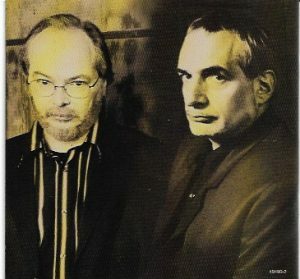 Walter Becker, one-half of the creative force that was Steely Dan, passed away at the age of 67. Together with Donald Fagen he founded one of the most influential groups of the 1970s, practically inventing the jazz-rock genre. Their songs are cerebral, sophisticated and excellently produced. Their first album, 1972’s Can’t Buy A Thrill, is in my opinion one of the best debuts of all time by any band. Years ago a musician friend of mine asked to borrow some of my Steely Dan CDs as he was planning to incorporate some of their songs into his band’s repertoire. He returned the discs a few days later, saying they were too hard to learn. Here’s my own personal tribute to the legend that is Walter Becker, in the shape of a Spotify playlist comprising some of the Dan’s best tracks. I hope you enjoy them, and that the list serves as an introduction to this wonderful band.